Dunlap, IL - If you got to Dunlap High School any later than 20 minutes before tipoff Thursday night, you were not going to find a seat or a parking spot, as over 2,000 fans were packed into the gym for a sectional championship between the #1 Morton Lady Potters (31-2) and the #2 Richwoods Knights (32-1). In fact, the public address announcer had to announce for fans to squeeze together so they could fit everyone that had made their way into the gym, resulting in no aisles expect for the stairs on the two baselines, as well as a multitude of standing room only fans. 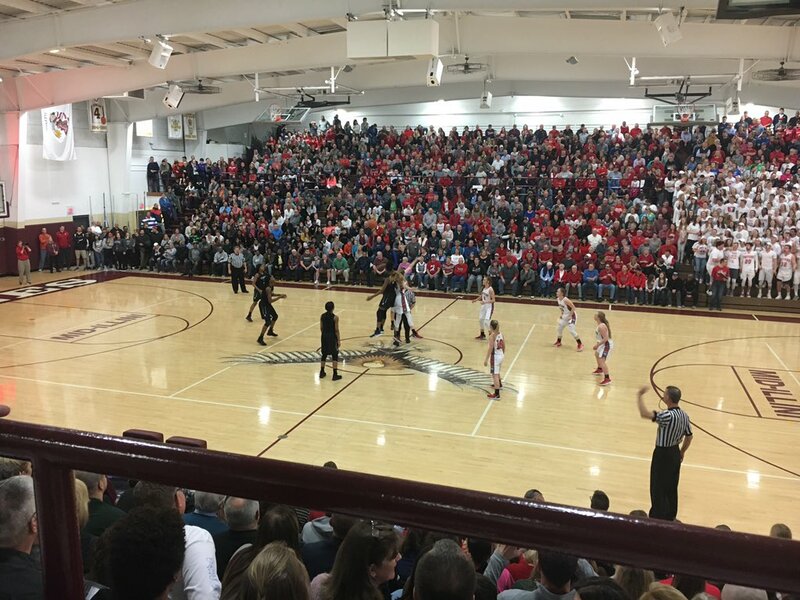 Dunlap High School staff said post-game they turned away an estimated 100 fans or so due to the much-anticipated large crowd. The Knights were feeling good right out of the gate. Despite not getting starters Camryn Taylor and Jaida McCloud in the scoring column, Kourtney Crane and Tiana Johnson were able to combine for nine points in the first quarter. Richwoods was able to play some of their best defense of the season against the Lady Potters. After only committing nine turnovers during the entire sectional semifinal, Morton had already committed five turnovers after eight minutes of play. On top of that, all the three-time defending state champions could muster was a three from Kassidy Shurman. Richwoods would hold an 11-3 advantage after one. The second quarter wasn't necessarily Morton's best in terms of total points scored, but it was the only quarter they were able to outscore Richwoods. The Lady Potters were able to get threes from both Maddy Becker and Courtney Jones, to go along with two-pointers from Tenley Dowell and Josi Becker. That still wasn't enough. Another three turnovers in the second quarter gave Morton eight at halftime, and Richwoods, behind a six-point quarter from Camryn Taylor, took a 20-13 lead into the halftime locker room. What came next was not what Morton fans would've expected. Turnovers continued to be a problem, and Richwoods would shoot their most free throws in a quarter, making five out of 11 from the charity stripe. The scoring was spread out some more in the third, as five Knights cracked the scoring column. Morton's scoring in the third quarter was brief. Very brief. In fact, not one Morton player was able to score in the third, putting Morton in unfamiliar territory - a scoreless quarter. Piecing all of that together, Richwoods would have a comfortable 20-point lead with just a quarter to go. Morton would go on to have their best offensive quarter of the game, tying Richwoods in the fourth at 16-16. There was just too much Knights in this one. Morton did not commit a turnover in the quarter for the first time in the game. Lindsey Dullard scored all of her team-high seven points in the fourth. The Lady Potters were also able to dish out three assists in the final frame. A late technical foul was assessed to Camryn Taylor for throwing an elbow, but the game had already been decided, so the technical free throws were not a factor. Richwoods' Kourtney Crane had a seven-point quarter of her own, finishing with a game-high 18 points, and Richwoods would go on to win the 3A Sectional Championship, 49-29. The loss ends Morton's chances of winning a fourth consecutive state championship, which would've been the first ever time on the girls side, and the third time for either gender. In the last four seasons (14-15 through 17-18), the Lady Potters have a record of (131-10). Richwoods winning the title gives them their first sectional plaque since the 2012-13 season, when they finished (26-7) under current Dunlap Head Coach, Heather Cassady. It's current Knights Head Coach Todd Hursey's second sectional championship at Richwoods, having won one with the program back in 2009-10, beating Metamora in the final, 58-57. Morton graduates three seniors. Those are Josi Becker (ICC Signee), Kassidy Shurman, and Caylie Jones. The Knights advance to the Coal City Super-Sectional to take on the Lady Kays of Kankakee. Tipoff is this Monday, February 26th, at 7:00 pm.